Osteoarthritis is a term used to describe a type of arthritis, which typically involves degeneration of joints, as well as the growth of painful bone spurs. While degenerative joint disease or arthritis has been the go-to term to describe this medical condition for many years, some researchers feel that osteoarthrosis provides a more accurate description of the disease. This is because the term arthritis by definition alludes to a disease that causes inflammation. However, in osteoarthritis, inflammation is not usually the most prominent symptom. Instead, typically inflammation in osteoarthritis occurs as a complication of the disease itself, with bone spurs being the more direct symptom of osteoarthritis. In osteoarthritis, the area around a joint, which is normally protected by cartilage and tissue, degrades, allowing the bones to rub directly against one-another. Over time, small fractures, often called microfissures or microfractures, develop on both bones in the joint, which results in new bone growing. The new bone is the result of the body attempting to heal the microfractures, causing increased bone density in the joint and the formation of bone spurs. In the past, researchers have believed that indications of osteoarthritis can be found as far back as the jurasic period, which dates the disease at over a hundred and fifty million years old. However, this belief is not completely accurate, as the evidence suggests a similar disease of the spine, while osteoarthritis is defined as a disease around joints that move. Over time, typically in quite severe instances of osteoarthritis, cartilage will completely disappear, leaving the bone areas rubbing directly upon one-another. In instances where the cartilage is functionality gone, eburnation will usually occur, which involves the affected bone becoming grooved or polished. However, like the distinction between osteoarthritis vs osteoarthrosis, where the implication of the term is that inflammation is a main symptom, which is not typically the case, eburnation is not a direct symptom of arthritis. Eburnation can be caused by other diseases and is the result of near-complete cartilage loss in a joint. In the body, the main function of cartilage is to provide lubrication and free movement between joints. However, moving the joints also results in movement of the fluids around the joint, allowing the area to receive important nutrition to the joint. In the joint, mucopolysaccharide ground substance helps maintain a healthy joint, however in a joint that has been damaged, such as by injury or diseases, the ground substance does not move as freely, resulting in quicker cartilage decay. Another factor that can result in damage to the joint is bone elasticity, as even though bones look and feel quite solid, they actually act as shock-absorbers. As humans move, cartilage provides a way for two separate bones to move together, transferring much of the actual force to the bone. However, as bone density increases, more of the force is transferred to cartilage, contributing to faster degradation of the cartilage. Increased bone density often occurs after a severe bone injury or tramua, as well as less obvious bone injuries , including microfissuring. Obesity is also often considered to be a factor of degenerative joint disease, however, much of this has to do with the joint itself. For instance, arthritis in the ankle is quite uncommon, especially when there has been no serious injury to the ankle or foot. 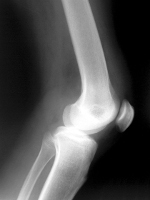 However, arthritis of the knee is far more common, despite both areas being weight bearing. The major difference between these areas is the type of joint, with the ankle being far less complex, as well as much more compact.